His eye for talent focuses on people who understand priority and bring persistence till they get it right. As a leader he wants to ensure people who demonstrate these skills are given new opportunities. It is great to see a self-aware leader who can say “As a CEO I don’t want to overstay my welcome and accept I only have a certain range of capabilities.” Boards, are you ready to hear this from your CEO? The plan is a lot easier than the execution. Business is about people and change. You need the right critical mass of people. Opinion leaders are not on the formal organization chart. Find them and bring them in on the vision. The board’s role is critical and is the most senior level of leadership. The role they serve for the CEO is holding the team accountable to the plan and being supportive of transformation. 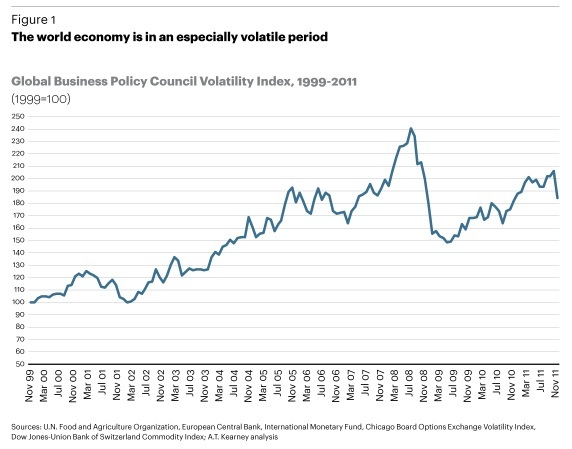 Things get worse before they get better so the board needs to understand the cycle of the strategy. As we read through proxy statements and prepare for Annual General Meetings, let us not forget to have some fun. In that spirit, bring along this bingo card to add to your engaged listening. Winning cards get to leave the meeting and get on with their lives. 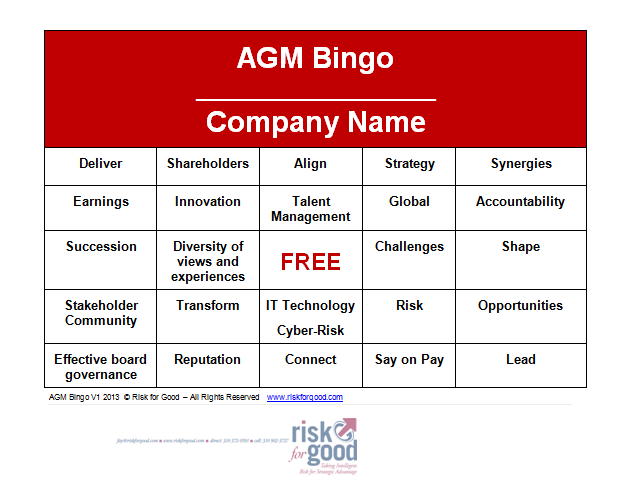 Hi, I’m Fay Feeney, my day job is CEO of Risk for Good where we equip CEOs and their boards to govern in this new mobile, transparent, connected world by bring digital intelligence to the competitive uncertainty in the equity markets. I’m also the President of the Broads on Board program for Broads Circle which is an executive-level networking group with a focus on MONEY and POWER for WOMEN. The mission for Broads Circle is to connect senior level business women. We believe that successful, impactful, powerful people have strong networks. They draw on these networks in driving revenue and growing capital for themselves and their ventures. At Broads Circle we talk exclusively about issues related to Money and Power for women. 1. The world is changing before our eyes; use your influence where you have it – with clients, in your spending, where you invest and with family & friends. You never know who in your network has board opportunities. Stay connected – if you are in the flow of learning about board opportunities let me know. 2. Luck favors the prepared – stay informed on corporate governance. 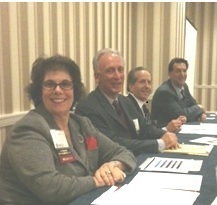 You can join me on Twitter #Corpgov or consider attending a NACD Director Professionalism course. We’ll have a session August 15-16, in Newport Beach. I’m proud to be a NACD Leadership Fellow. My corporate governance education builds confidence for the Nomination/Governance committee, is proxy ready and more important shows I’m serious about building company value. 3. Narrow your boardroom focus. 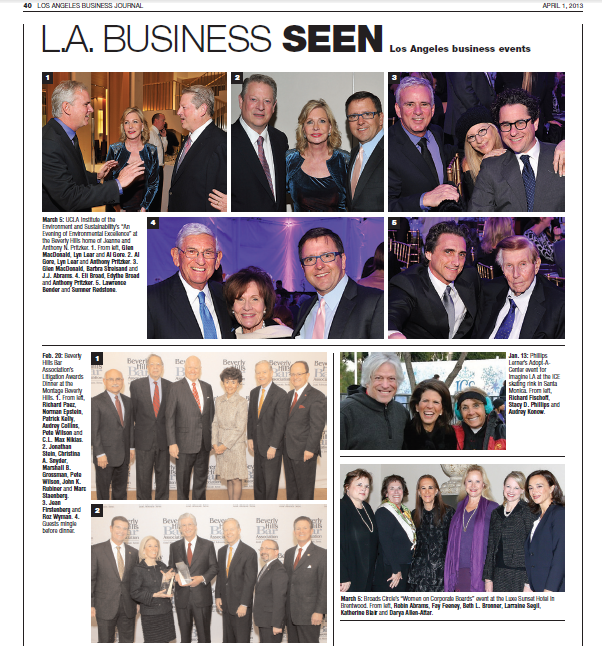 Think about board service opportunities starting with private companies and public companies on the Wilshire 5000. The F500 have plenty of people vying for those seats. For example, let’s look at the 79 S&P 500-listed financial services firms, these provide a window into the governance trends affecting these companies. Financial services firms welcomed more new directors; 53 new independent directors joined S&P 500 financial services boards in 2012 compared to 45 in 2011. The “weapon of choice” in the digital revolution is proving to be the smart phone. It provides stakeholders a tool to connect with like-minded individuals anywhere, any time. This year, when speaking on social technology, I’ve been asking directors to think about issues from the constituent’s viewpoint (investors, customers and employees) for a start. Broadening to stakeholders is the next level request. I recently heard Mark T. Bertolini, Chairman, CEO & President, Aetna Inc., speak at the NACD Board Leadership Conference. Yes, he has a Twitter account @mtbert, but that’s not the only reason I like him. 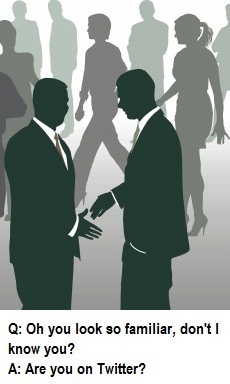 He spoke to the value of having the CEO be an active participant in the social conversation. Here is a link to his session, which is a blueprint for the #SocialCEO. We certainly expect our C-suite to align their messaging to demographics, but it is far more complex than it appears. People are expressing their underlying attitudes and values in a variety of ways that are being expressed in the public domain on Twitter, Facebook, blogs, etc. An expectation for CEOs is to listen, assess and, if appropriate, adapt to the feedback. It reminds me of the first two steps in a risk management process: identify and assess. I encourage directors to stop and consider ways they can help their CEO speak to values that define, strengthen and grow the company. Filed Under: Blog, Boardroom Video Tagged With: Equipping CEOs and their boards to unlock opportunities in the digital age. “Your business is operating in a digital revolution, use your peacetime wisely” with this statement Richard S. Levick, Esq., President & Chief Executive Officer, Levick kicked off our panel on “Everything Directors Need to Know About Social Media” at the 2012 NACD Board Leadership Conference. Speaking to a packed audience my curiosity was: who in the audience will leave seeing social media as a strategic business advantage? 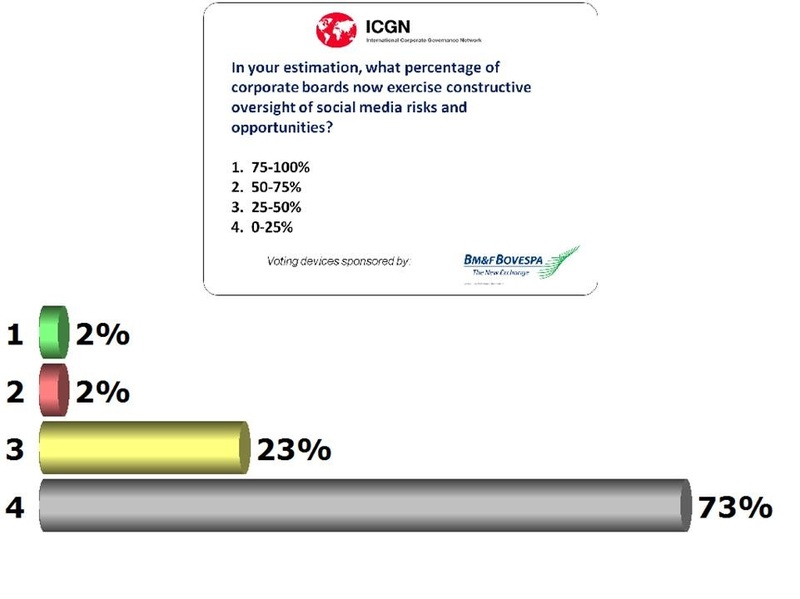 Will they take action and get social media on their next boardroom agenda? Don’t let social media get put in a functional silo: it touches and impacts every part of your business. In the boardroom, it is too large for any single committee…this is a topic that needs the entire Board’s attention. Don’t believe social will go away, make a list of questions and begin the conversation with your Board and Management team. It was time to tap into insights from Neil S. Braun, Dean of Pace University’s Lubin School of Business in New York. He has previously been President of the NBC Television Network, Chairman and CEO of Viacom Entertainment, Braun serves on the board of directors, audit, compensation and governance committees of IMAX Corporation. Neil spends many hours now with students who are driving the digital revolution using social and mobile technology. Asked about how to connect with students, he shared that email is becoming passé. If you want to get your message to his students it requires texting. They are using their mobile phones as ways to stay connected in their world. 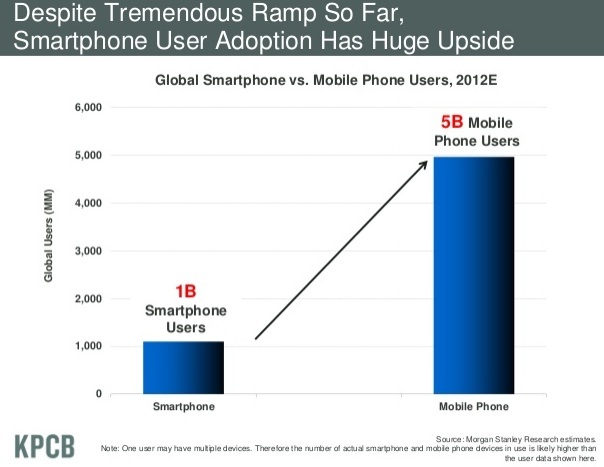 This is consistent with a global trend on mobile devices. At the end of 2011 there were six billion cell phone subscriptions globally, which means that 86% of the people on the face of the earth can now connect and talk or text directly with each other. By comparison there are only 2.3 billion internet users. More people in India now have mobile phones, than have indoor plumbing. As directors your role is to support your CEOs in exploring how they can socialize and humanize the company as a place to buy, work and invest. It is important to remember that these social conversations have just begun with your customers, employees and investors. With or without you they are talking about your brand with each other. The challenge for the business is to accept that you do not control the conversation anymore. No surprise that directors would have reservations when it comes to social media. 1. Show me the ROI on what people had for breakfast. 3. I am concerned about my privacy. 4. We are B2B / We are industrial. Our customers are NOT using social media. 5. There is too much change to keep up with. If you’ve had these thoughts, now is time to put them behind you. In today’s connected world your company has a unique platform to listen and communicate with their customers, employees, investors, fans and critics. Social media is simply another media platform to help you achieve your company’s objectives. It is growing in importance to your company and your industry. Social media encompasses many platforms with one thing in common….it provides a two-way conversation. The pivot for business is to understand and adapt their communications to participate in a conversation they no longer control. The 21st century boardroom needs you to use your creativity to support your CEO and the strategy that optimizes digital opportunities. You need to encourage your CEO to play offense and get your company aligned with social media. To empower CEO success, you need to step up and play defense for your CEO. The role you play is to support your CEO in this exploration. So take your hands off the keyboard. Focus your thinking on how social media is impacting your business and how it has opened up a new media channel. The question to ask is: are we listening? Social media is now being used by customers, employees, investors, stakeholders, and critics to discuss your company: Social media listening can happen across the enterprise: sales and marketing, investor relations, human resources, risk and business development. Each area has unique conversations happening on social media. How is your CEO exploring methods to listen and summarize these conversations for you? Your CEO should ensure that the procedures for crisis identification and escalation are defined and understood by employees and your board. 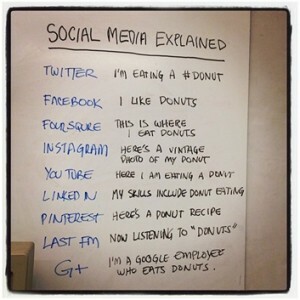 How would you describe your social media policy? What are your vulnerabilities compared with your competitors? What insights are coming out of social media listening from the operating units? How are you monitoring for customer service and crisis conversations? What is your plan for speaking and listening during a crisis? What training are you doing for employees? What have you done to ensure your outside advisors can be a resource? What social media information is essential for the board? How is the information formatted for the entire board and/or by committee? How often does the board want to review their social media dashboard? What competitive information can be culled from social sites (big data) that provide unique insights into investors, customers, industry, competitors and management? What is being said by our investors, analyst, shareowners and stakeholders around our annual meetings, quarterly calls and presentations? You do not have to tweet to understand the social media landscape and how it is changing your business opportunities and risks. We drive cars yet many of us don’t know how combustion engines work. However, decide what you will do to accelerate your learning curve to become engaged in the broader topic of social media and how it impacts your business. In the Risk Map below, social media is at location 4, in the yellow zone. 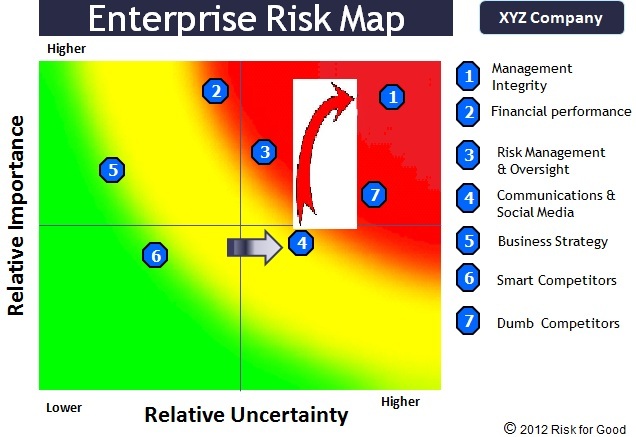 In times of crisis, social media will accelerate your reputation risk by moving in the direction of the red arrow. This is why it is critical for you to have a prepared plan for managing social media as part of your crisis management strategy. Your oversight of the social media strategy is essential and requires management to be proactive in their thinking and planning. Social media is challenging our thinking about who talks and who listens. In all cases, the key is to ensure you have a plan that can see across the enterprise. Holly specializes in advising companies and boards on corporate governance matters. Richard Levick, Esq. President & CEO of LEVICK Strategic Communications, represents countries and companies in the highest-stakes global crises and litigation. I’m back from my travels to Rio. The ICGN Annual Conference was an amazing gathering of investors from around the world. 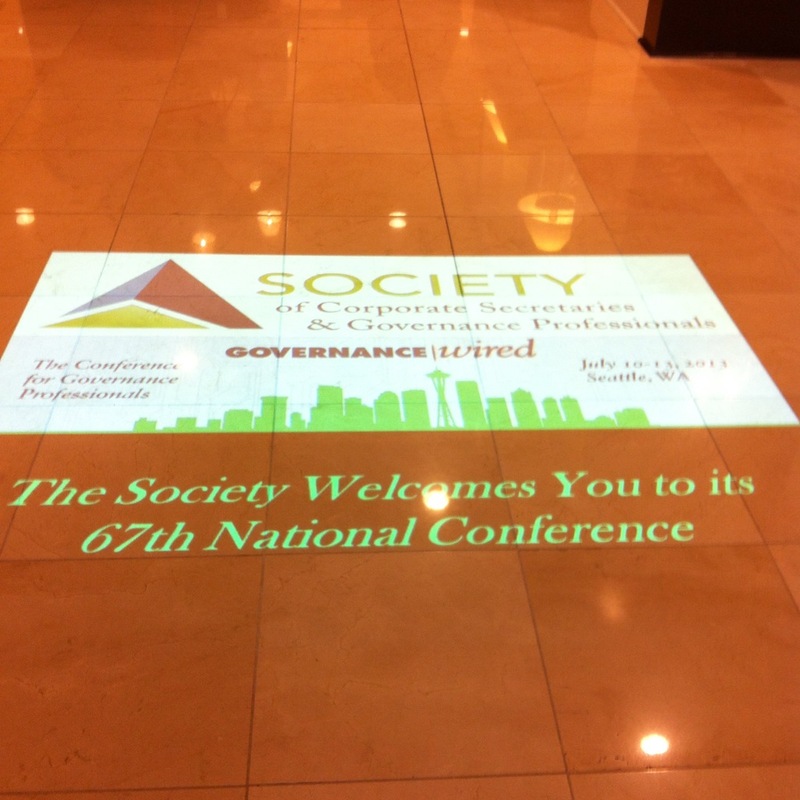 Their voices added to the corporate governance conversations I’m privileged to hear in the US . Our session on social media was a hit with attendees wanting to see how social media works from the investor perspective. One half of me is shaking my head while the other half is working on products and services to fast track boards, CEOs and investors into 21st century communications. Here are the notes from our session and would welcome you adding to the ideas. Investors and corporate boardrooms alike increasingly see social media as a channel for advancing goals as well as a risk to manage. One illustration of the power of social media: during the ICGN’s first Rio day some 14 tweeters messaged on the conference from Brazil, the US, Canada, Portugal, Switzerland, Japan and Jordan. Totaling their followers, the number of people around the world who received at least one tweet from the conference was 93,781. 1. 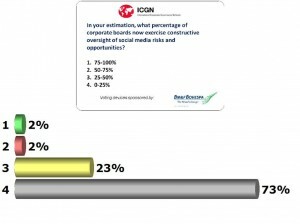 What would you recommend boards do to prepare for social media risks and opportunities next season? 2. What can you imagine social media and technology allowing companies to do in 2020? 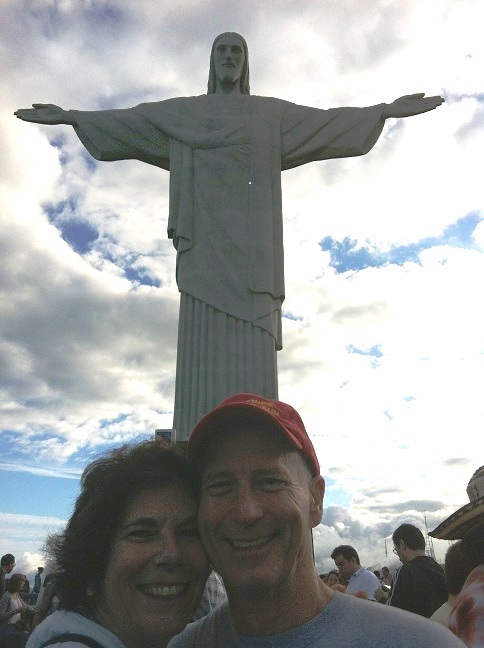 Yes, I’m here in Rio for the ICGN Annual Conference. Here are my remarks for the panel on Social Media and Corporate Governance. Let’s get this conversation on social media happening with CEOs and their boards. It is too important to building trust and transparency. Ola, Stephen, Santiago and the ICGN conference committee for including me in this amazing event. For the past 15 years I’ve been active in engaging the internet and social media for my business & personal development. As a result, my colleagues in corporate governance have labeled me the “Digital Whisperer”. Today I’d like to share some of my experiences and “lessons learned” with you. We are early in the internet age. This 2nd generation of the internet (web 2.0) is where individuals, investors, activists and companies can use the web as a media platform to shape the perception of their company and their board. You control your own site, or blog, or tweet; and are able to control your own data. The importance of the company’s web site is well understood by most of us. Less understood is the importance of interactivity, another key feature of web 2.0. Being “social” in the digital age means creating the opportunity for user-generated content on line, and using this interactive feature to exchange information. We know these applications such as: Facebook, Linked In, Blogs and Twitter. In the first wave of the digital economy, the focus was on one-way conversations corporations were having with their customers. The marketing department was in charge of overseeing that information was carefully controlled and distributed. Marketers are known for talking, not listening. We are now in the second wave of the digital economy. Two way connections will dominate with less hierarchy, not more hierarchy. Information about your company, its products, and its policies can no longer be carefully controlled and distributed. As you and your board become digital citizens, you will be leading socially enabled enterprises with your stakeholders, your board members, and your key investors. Take a moment to think where you were 8 years ago in 2004 when Facebook was being launched. I was sitting with CEOs in their boardrooms briefing them on what I was seeing in their operations from a risk, safety, health, and environmental perspective. I had limited time with them so my job was to inspire them to improve their profits by enhancing the safety and sustainability of their workplaces and products. This included focusing on the people, products, use of resources and supply chains that made them money. The way to focus on these audiences is to listen to them. Investors, stakeholders, and the employees on the loading dock all have ideas for improvement and an opinion about the job management is doing. This has always been the case. What has changed is that now several platforms exist for these individuals to communicate their ideas and attitudes. They now find, nearly instantly, that these ideas and attitudes are shared by their peers. When their opinion captures the sentiment of others, then “word of mouth” becomes magnified at large scales with customers, employees, investors and activists. These events become opportunities or risks, and can quickly shape a company’s future.